Oskar Fischinger was born on the summer solstice in 1900 in Gelnhausen, Germany. He originally chose music as a career, studying violin and organ building (which attracted him because it combined precise knowledge of technical processes with mathematical harmonic theory) before 1914. Too young and unhealthy for war duty, he was trained in architectural drafting and tool design. Around 1920 in Frankfurt, he met Dr. Bernhard Diebold at a literary club. Seeing Fischinger's abstract scroll sketches, Diebold urged Oskar to take up abstract filmmaking. In April 1921, Fischinger was thrilled by the first performance of Walther Ruttmann's Lichtspiel Opus 1 (an abstract film with a live musical score) and vowed to devote himself to absolute cinema, which could best combine his skills in music and graphic art. He resigned his engineer's job and moved to Munich to become a full-time filmmaker. His first film experiments, made in the early 1920s, are among his most radical. In Wax Experiments and Spirals Fischinger designed visual patterns of extreme complexity which often develop in overlapping cycles, yet he interrupts these patterns with radical editing of single frames of contrasting imagery. Among Fischinger's form-breaking experiments of the era were the abstract multiple-projector performances (under the concept name of Raumlichtmusik or Raumlichtkunst), with individual performances named Fieber, and Macht (and possibly other names). These were performed c. 1926-1927 using up to five film projectors and several slide projectors. Early in his film-making career, Fischinger established a pattern of alternating commercial work with personal, experimental film-making. While it seems clear that he preferred working in an avant-garde way, commercial work afforded both income and access to the most advanced technology, and Oskar was, among all of the radical film-makers of the Twenties, the most technically knowledgeable and adventurous. Oskar supported himself during this period by making conventional animation, which demonstrates his mastery of realistic anatomy, perspective, and conventional story-telling. But his personal film Spiritual Constructions shows the same radical consciousness and experimental techniques as his abstract films: the slender tale of two drunks who argue and stagger home becomes an epic voyage of warping shapes and thwarted perceptions, rendered again with single-frame editing and scratching directly on film frames - devices that would re-emerge thirty years later in avant-garde film-making. During the summer of 1927 he walked from Munich to Berlin, recording his journey in single-frame exposures - a premonition of the diary films two generations later. He was hired to make special effects of rockets, starscapes and planet surfaces for Fritz Lang's 1929 science-fiction feature Woman in the Moon. When he broke his ankle on the set, he began drawing animations on white paper in charcoal while recuperating, which led to his remarkable series of Studies, comprised of 14 short black-and-white film experiments tightly synchronized to music. A few of the later Studies were drawn by his brother Hans, most likely under Oskar's supervision. In each of the Studies he set out to solve a different visual problem: in Studie Nr. 6, a flexible aerodynamic movement; in Studie Nr. 7 a deep-space perspective of hard-edged figures contrasted with a flat surface where sensuous art-nouveau shapes metamorphose; in StudieNr. 8 an orchestral multiplicity and density of figures, etc. These Studies screened widely in Europe, Japan and America, and created such demand that by 1932, Fischinger's studio had grown to include his brother Hans, Elfriede (who became his wife in 1933), and three other women. At this time, Fischinger was also pursuing a series of film experiments with drawn synthetic sound (Ornament Sound Experiments). 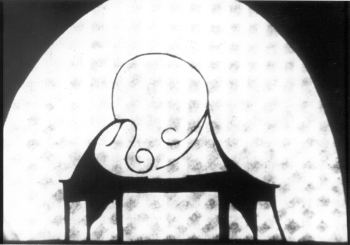 The close synchronization of the Studies with music (originally begun as ads for recordings, thus direct precursors of the music video) made them immensely popular with audiences worldwide, but after the advent of the Nazi regime, abstract works were classed as degenerate art, and it became more difficult to make any further experimental films. Fischinger was involved with the development of the three-strip GasparColor film process, a European rival to Technicolor. With his technical training and exceptional understanding of the fundamental processes of cinema, Oskar was one of the very few who mastered this difficult process. The use of three-color film was relatively new in the cinema in the early Thirties, and while in Europe it was still not possible to use three-color film on an entire feature, GasparColor did lend itself to short films which did not require a realistic image. Although "experimentation" was still proscribed, color opened up new venues for Fischinger's animated and abstract works in the field of the commercial advertisement - a media-hungry world that thrived on sensation and novelty. Fischinger's 1933-34 film Kreise (Circles) was cleared as an advertising film, but it is essentially abstract imagery, and the ad text only appears in the last few frames. Fischinger then created an animated color advertising film, Muratti Greift Ein (Muratti Marches On), and another color film, Composition in Blue, using small geometrical models. He exhibited the Composition at foreign festivals. The critical and popular success of Muratti Marches On and Composition in Blue attracted a great deal of attention, and Paramount offered Oskar work in America. Paramount brought Fischinger to Hollywood in February 1936, but did not allow him to continue his work in color film, and his tenure at the studio was short. A grant from The Museum of Non-Objective Painting (Guggenheim Foundation) allowed him to buy his short film Allegretto back from Paramount, and in 1943 he was able to complete it in color as he had originally intended. Fischinger used a cel-layering technique to animate formal visual equivalents of the musical concepts of rhythm, harmony and counterpoint. He implemented a "divisionist" technique of changing colors from frame to frame in order to achieve particularly luminous and chromatic hues that could not be produced by normal methods of animation photography. The film was shown at museums and centers of advanced art all over the world, and Allegretto (1936-43) eventually came to be recognized as one of the most accomplished pieces in the history of visual music. Fischinger found it extremely difficult to work in studio situations, enduring episodes at Paramount (1936), MGM (1937), and Disney (1938-9). He composed An Optical Poem to Liszt's "Hungarian Rhapsody No. 2" for MGM. He designed the Bach "Toccata and Fugue" sequence for Disney's Fantasia, but quit because his designs were simplified and altered to be more representational. Hilla Rebay, curator of The Museum of Non-Objective Painting, supported Oskar's work during the difficult war years with several grants. Rebay commissioned him to synchronize a film with a Sousa march (to demonstrate loyalty to America; this film was An American March). Oskar then proposed a film without sound in order to demonstrate the artistic validity of non-objective imagery, but Rebay insisted that he make a film to Bach's "Brandenburg Concerto No. 3." While carrying out his commission for Rebay, Oskar discreetly composed the silent masterpiece Radio Dynamics. Although The Museum of Non-Objective Painting specifically required a cel animation film, Fischinger made his Bach film as a radical documentation of the act of painting, exposing a single frame each time he made a brush stroke. The film parallels the structure of the Bach music without slavish synchronization, and rediscovers some of the playfulness inherent in Bach's sense of formal invention. Although Motion Painting No. 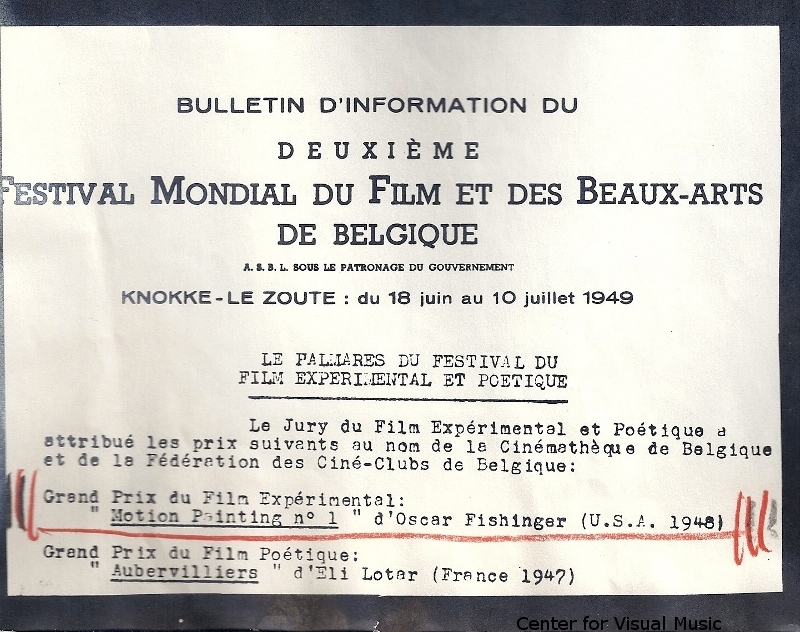 1 won the Grand Prix for Experimental Film at the Brussels International Experimental Film Competition in 1949, Fischinger never again received funding for one of his personal films (only a few ad films in the 1950s). He turned increasingly to oil painting as a creative outlet. During the last twenty years of his life, Fischinger worked on a few commercial projects, several unfinished film and multimedia projects, many unfinished animation drawings, and by the end of his life had completed a substantial body of graphic work including some eight hundred paintings. 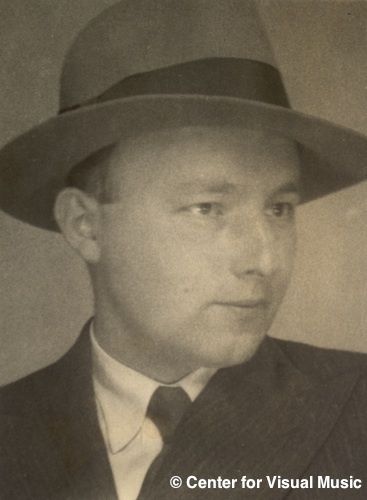 Oskar Fischinger died on January 31, 1967. His films continue to be included in exhibitions at major museums and cultural institutions worldwide, recently at the Whitney Museum, New York; the Guggenheim Museum, NY; Centre Pompidou, Metz; Tate Modern, London; MoCA, Los Angeles; the Hirshhorn Museum, Washington DC; Reykjavik Art Museum; Barbican Centre, London; Lentos Kuntsmuseum, Linz; ICC Tokyo and many others internationally. Text and images on these Fischinger pages are protected by Copyright law (Title 17 U.S. Code). Please seek permission before reproducing any of this material.